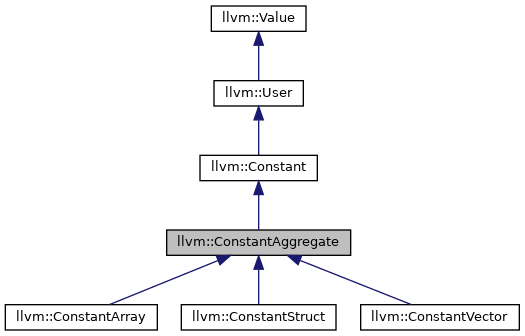 These constants are aggregates of other constants, which are stored as operands. Subclasses are ConstantStruct, ConstantArray, and ConstantVector. 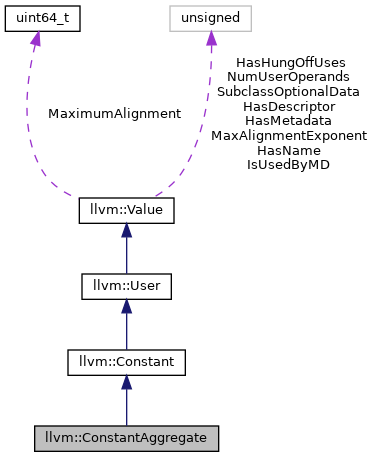 Some subclasses of ConstantData are semantically aggregates – such as ConstantDataArray – but are not subclasses of this because they use operands. Definition at line 389 of file Constants.h. Definition at line 971 of file Constants.cpp. References assert(), llvm::copy(), E, llvm::SequentialType::getNumElements(), llvm::Value::getType(), llvm::CompositeType::getTypeAtIndex(), I, llvm::User::op_begin(), llvm::ArrayRef< T >::size(), and llvm::ARM_MB::ST.
Referenced by llvm::ConstantStruct::get(), and llvm::ConstantStruct::getTypeForElements(). Definition at line 398 of file Constants.h.